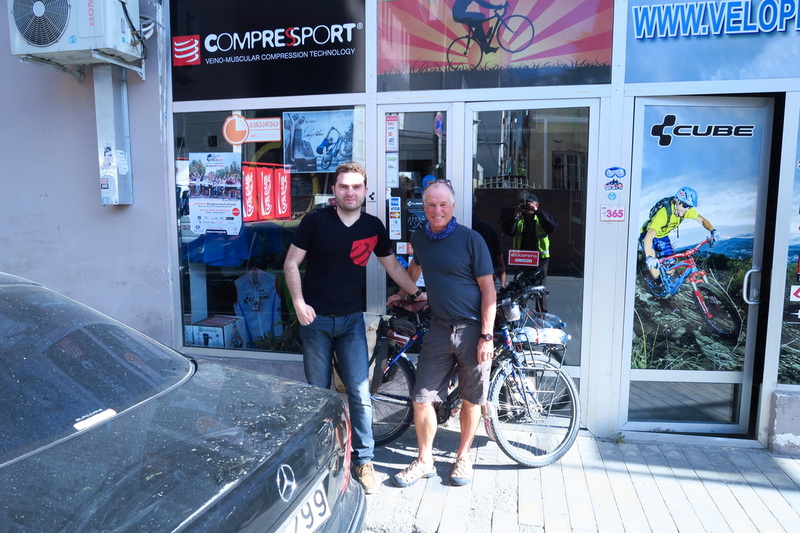 My time with Lado at Velo Plus cycles in Tbilisi was such a good break. It made waiting for my AZ visa effortless. Thanks so much Lado and Dima. Lado did not open the shop until about 0900. I headed over to the supermarket where great salad meals had been eaten in their dining area for the last week. Garlic and ginger was needed. Lado gave me general directions from town. The main thing was that the river was followed past the AZ embassy. My time in Tbilisi was gret, it is a very relaxing city, with some lovely old buildings and good services. New reading glasses were needed. In this street near the rail station there were no fewer than 40 optometrists with 600m. Needless to say a pair was found. There was an easy 10km or more out of the city. It was a great day. Fine and warm about 24 degrees. It was great to be riding in shorts and sandals again. Another flat tyre was repaired. This time a new tube was put in. My rim tape has been damaging the tubes, I tried to smooth it out as best I could. The security guys gave me a big yell and wave as I rode past the AZ embassy. Some great little pizzas were enjoyed as the city was departed. 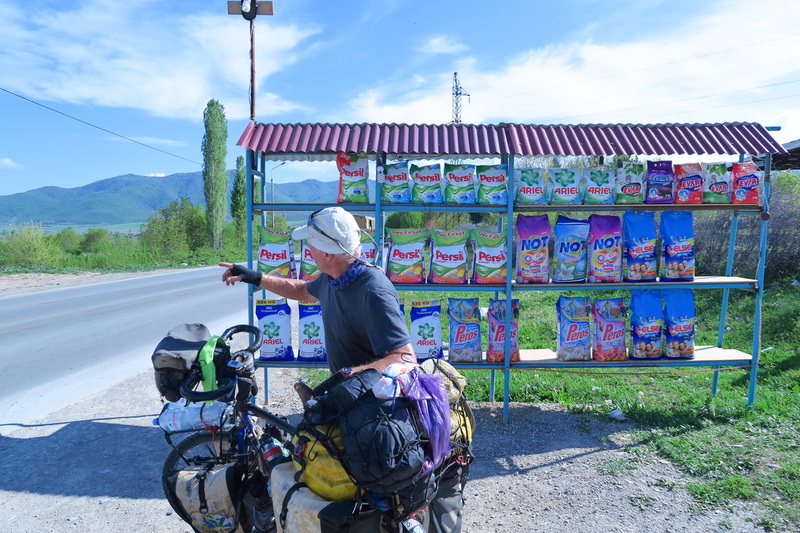 A stop was made in Shulavari at the supermarket for some yoghurt and to use the toilet. Here I took the wrong turn but soon realised. Once on the main road again another single cyclist was seen through traffic, he looked like he was in a hurry and was beyond yelling distance. The road now was generally flat and slightly down hill. The countryside was becoming lush green with some interesting hill features. Nearing the border, people had stalls up everywhere selling washing powders, they must be a lot cheaper here than in Armenia. Some men were enjoying cay on the roadside, they called me over. They wee a hardcase group of Azeris. They did not have to many good things to say about Armenians. Cay was enjoyed with them. Some 5km later I was at the border and easily got stamped out of Georgia. As explained in my visa section, there was a few difficulties on the Armenian side but really no problems. 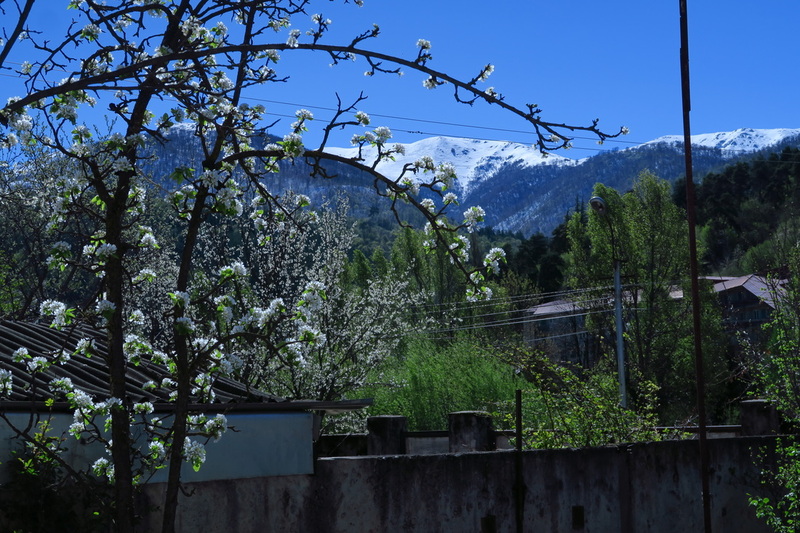 In the little town through the border, a beeline sim card was purchased. No one could activate for me. By the time I left here it was nearly dark. 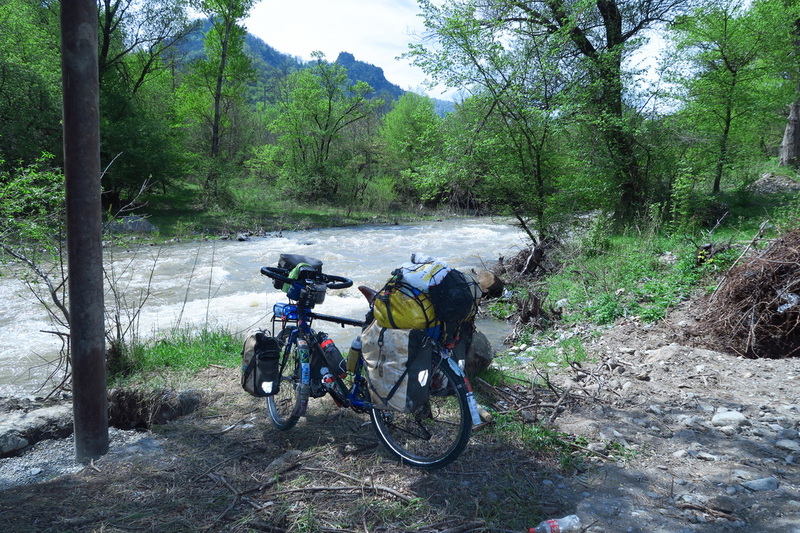 Riding on a good looking place to camp appeared down by a river. I asked a shop keeper if camping was ok down there. He said yes and something about the football field. They escorted up through the bushes to the football field by now there were some 6 of them . I had to wait until their captain arrived. The guys were great, they got my phone activated . If you get a Beeline sim, the number to ring is *110*80# and follow the prompts it is in English. The captain turned up in plain black clothes with another 5 troops. He had my passport and wanted to see my Azerbaijan photos. These two countries are literally at war with each other. He was happy with everything and said for me to leave at 0800. He was the only person who could speak English. My sign and action skills are getting good these days and can usually act out what is required. A kind of charades. It felt good to be camping here, no local would be around here unless he had a good reason to be wandering about after dark. By 2100 hrs there was already a heavy dew, though not to cold. A late pasta was enjoyed. Before taking one last look at the lights of Georgia across the river. This morning as expected, the dew was extremely heavy. The tent would have to be dried out somewhere along the way. It was great to be heading into a new country and culture. Some 6km up the road I turned left and slowly started climb. In the first village bread and some veges were bought for dinner. People were incredibly friendly, none could speak English. I knew just the basics, hello, goodbye, thankyou etc. The roads were asphalt but could not be relied upon at speed going down hills. A stop was made to speak to a couple of elderly guys just sitting around. 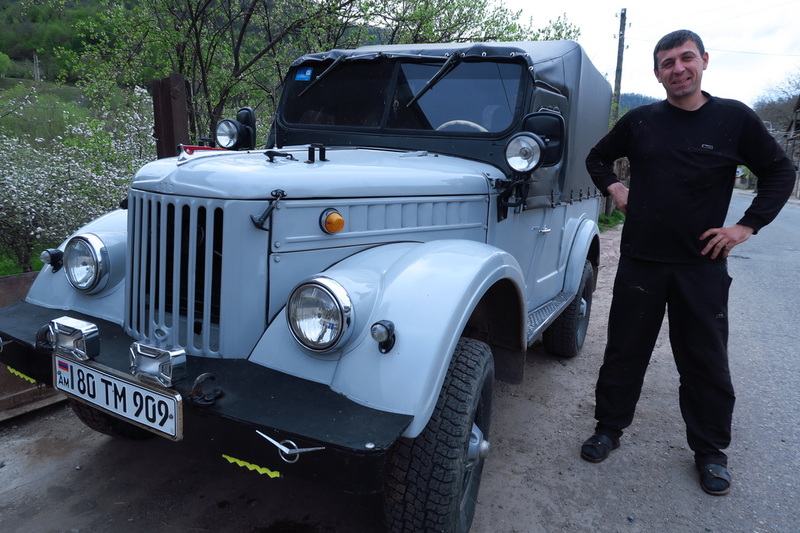 It was very rural and relaxed, many Ladas and other Russian cars were on the road. Many cars were old models. Few were blowing visible fumes. Many cars here run on gas. There were army vehicles and personnel in many places. On pumping up a tyre by the roadside, a vehicle with a soldier pulled up wanting to know what I was doing. 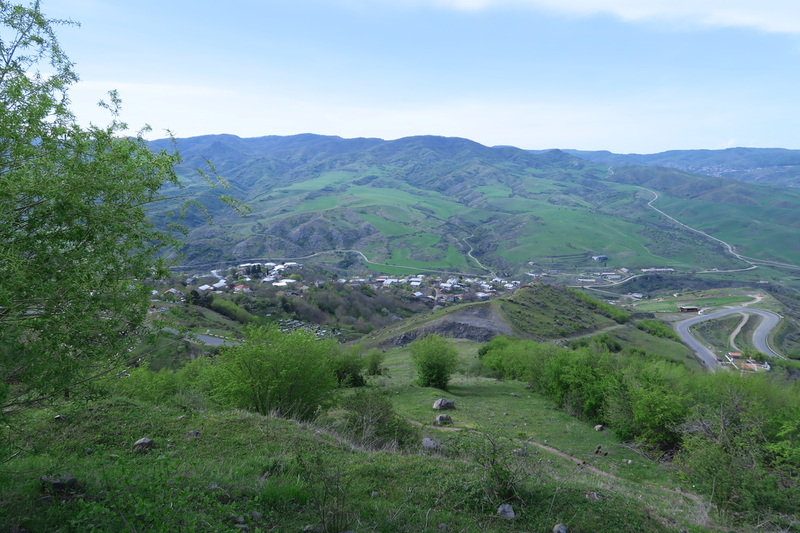 The countryside here in Armenia is so lush and green. Many of the larger deciduous trees are now coming out in leaf the scenery was beautiful. There were some tree crops but mostly lush pasture with few stock to be seen . Small villages were passed as usually, though most had no shops. There was one huge climb, where half way up I stopped at an elaborate rest area with a fountain and shelters. Here coffee and boiled eggs were enjoyed. There was still alot of climbing above me. 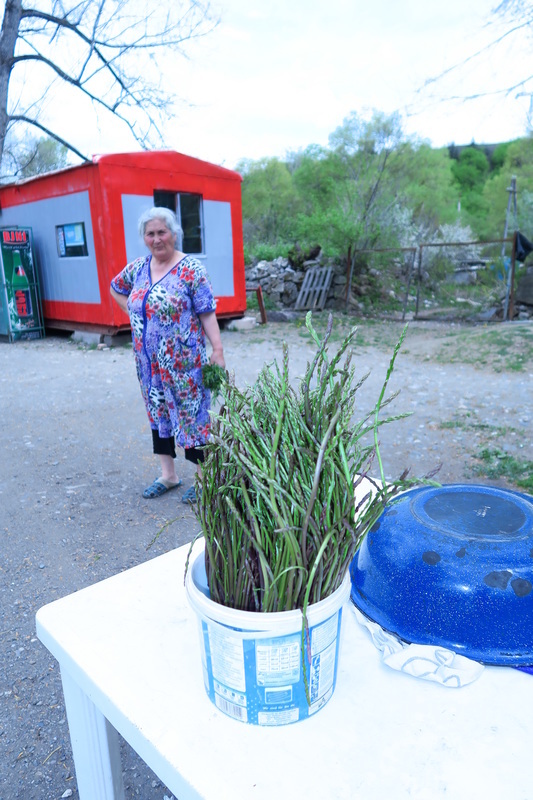 The ladies were selling asparagus and other vegetables across the road .One could speak English she gave me a good run down on how she thought the Azeris were evil people who had taken their land. The climb kept going for another few kilometres then payback commenced. From here on it was up and down in a rural setting all day .About 1800, with enough water, a search for the nights camp site began. Over looking the town of Azatamut with views across to the mountains, a track was taken amongst some small undulations. In here there was what looked like a building site. On closer inspection it turned out to be trenches and tunnels for warfare. I thought they must have been just used for training. I found a great hollow grassy spot. Having a look at my GPS maps. 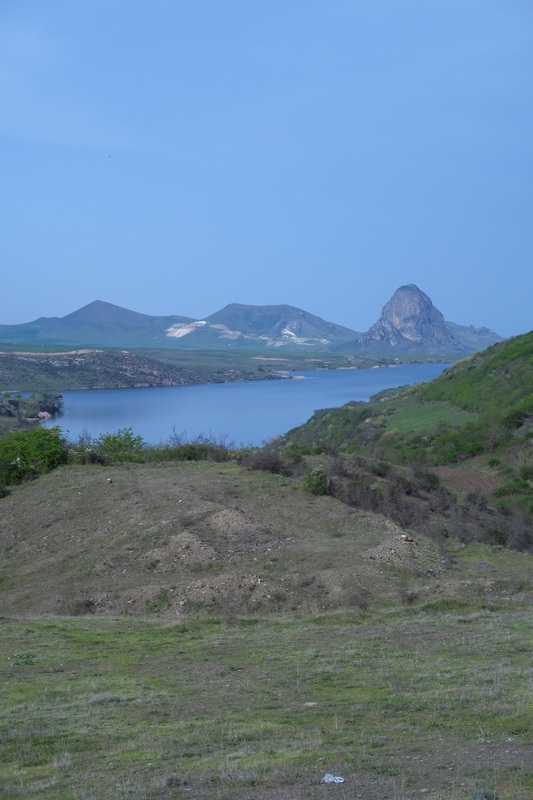 I was 400m from the small pocket of Azeri land. I paniced and could not get out of there quick enough, these were defensive positions used to fight the Azeris if need be. The last thing I needed was a second night of military intervention. I left in a big hurry. No one saw me thankfully. 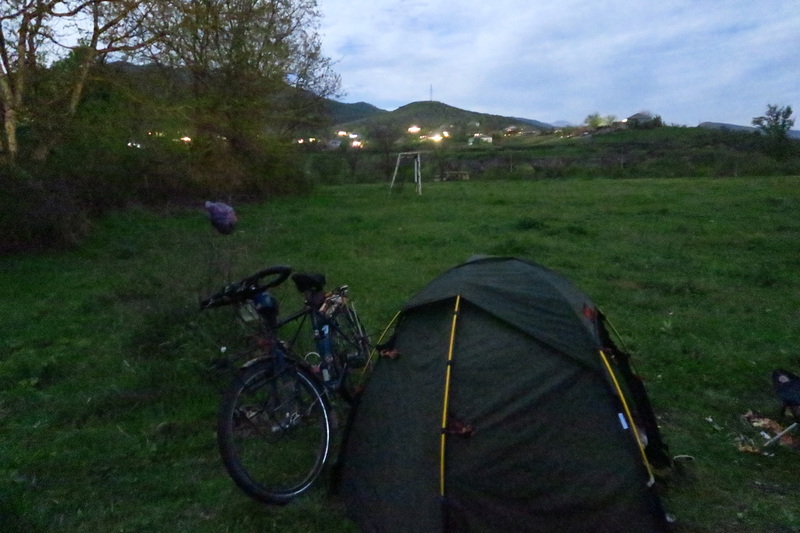 I rode the last few km into to the valley below, the first hotel was too expensive. 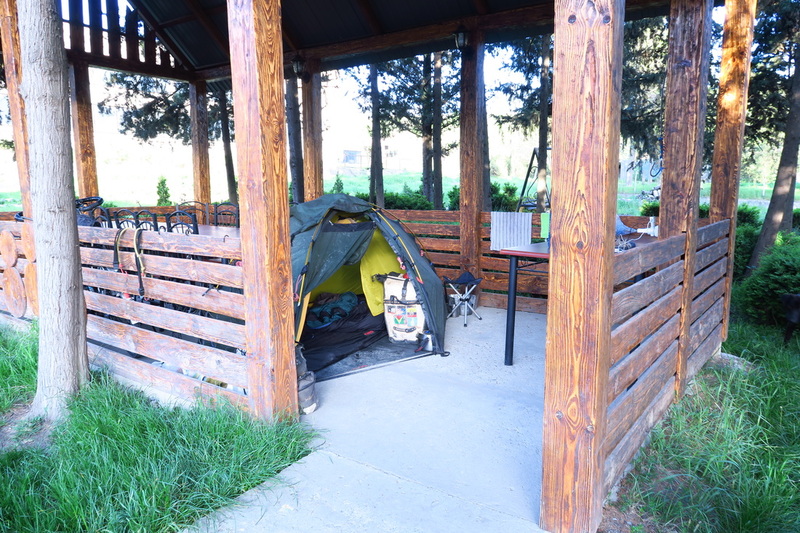 However the second one allowed me to set up my tent in the gazebos out the back it was great. The owners were nice people and shared cay with me. It felt so good to be somewhere safe. Military personnel had been seen all day around this border area. Another nice pasta was cooked. All my phone batteries were charged. A gret nights sleep was enjoyed. I was up early but took it easy and did not get away until 0930 . 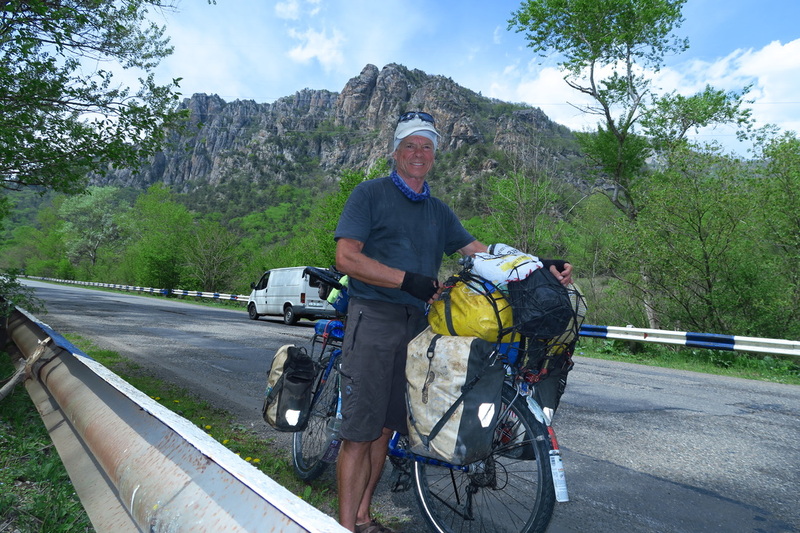 There was 85km to Sevan where I was going to meet Alex for a day or two. 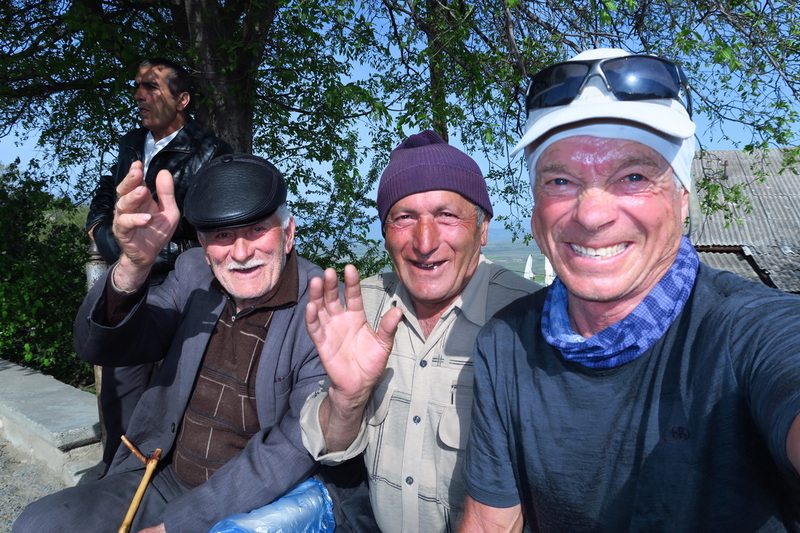 He was waiting for a package in Yerevan and is going to ride up to the lakeside town . Having said this I was going to spread the distance over 2 easy days, it was all gently up hill. 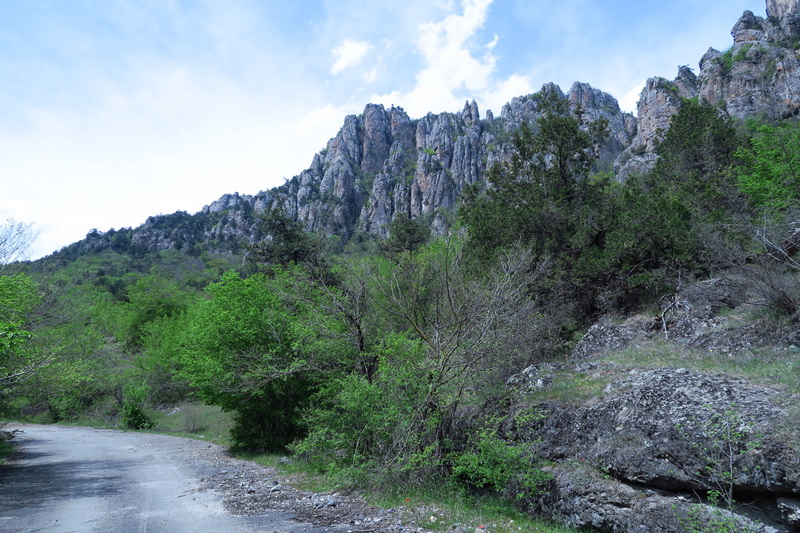 The road was absolutely magic following the Aghstev river valley. The sound of running water could be heard most of the day. I just took my time and spoke with people wherever I could and took lots of photos. Again the road was full of old Russian vehicles . It was a 24 degree late spring day. So enjoyable to be riding a bicycle. Late in the day looking for a riverside camp, one was found the problem was there were ants everywhere and I had to leave. There are now insects in the air a swell so my sunglasses have to be worn down the hills. 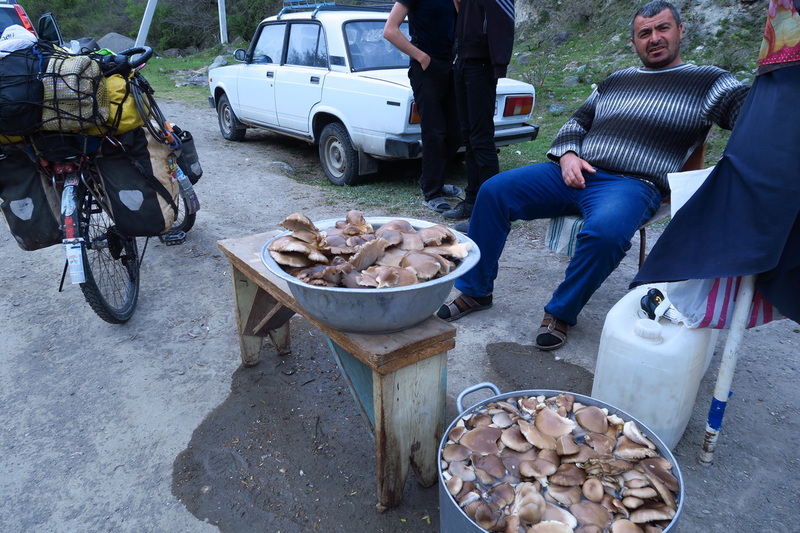 People were selling asparagus and mushrooms on the roadside. I bought some mushrooms and got a good recipe off a German man that worked here. Parsley and spring onions were bought in another village. 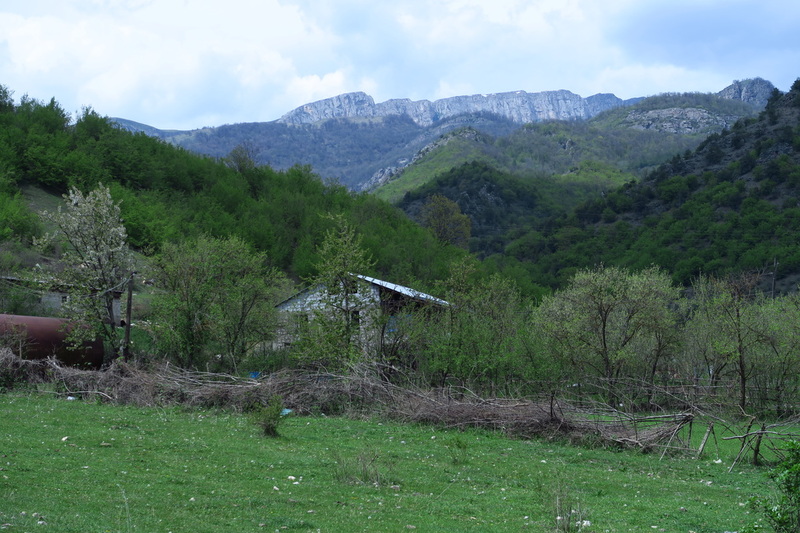 Nearing Dilijan and very worn out. I asked to camp in the back of a petrol station they said to wait for their boss but I did not. I got into the town centre still unable to find good campsite. Here, a guy pulled up in a Lada and said he had a guesthouse. I followed him back to his house. It was fantastic. Good hot water and a great room downstairs. I decided to stay here for2 days and just relax, the weather was for cold wet conditions tomorrow,. I got in touch with Aex he was happy to wait also. The mushrooms were fried in butter with salt, pepper and onions, they were delicious. I was actually very worn out. Yesterday involved some steady climbing all day. It was cold here, nice to be inside. It felt so good to climb into bed freshly showered and shaved. soap powders were for sale everywhere along the road before the Armenian border. The road had bought me from the horizon to here with still more hills ahead. out of harms way here. Many vehicles run on gas here. A spillage of grey in an otherwise green environs. Fresh seasons asparagus, not your normal variety. 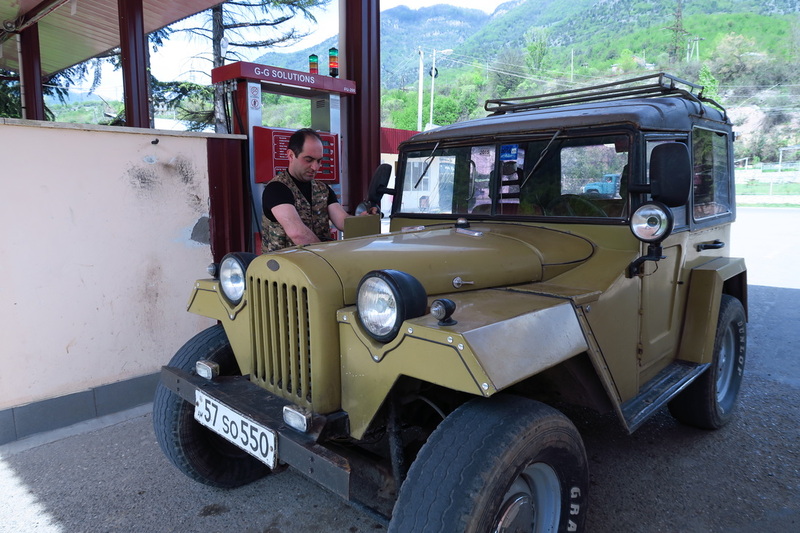 1955 Gaz 4x4, and proud owner. 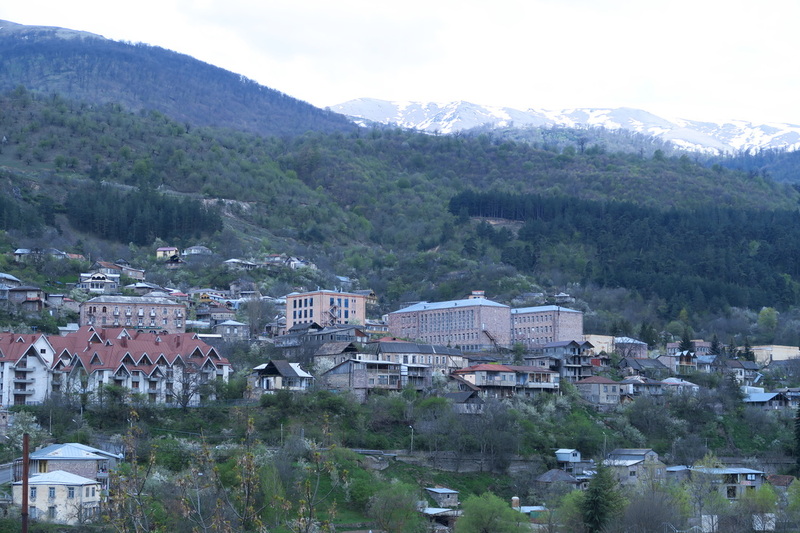 on arrival in Dilijan these ranges only had patchy snow upon them. It snowed the first night here .